What ages can participate in the Mountain West Youth Track & Field? 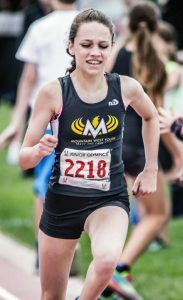 Mountain West Youth Track Club is available to athletes from 11-18 years old. The athlete will participate in the age group determined by the athlete’s age as of 12/31 of the current year. NOTE: Age groups are typically allowed to participate in 3 races, two field events, and two relays at most meets. *Steeple Chase may not be contested at most of the developmental meets. The registration fee is $350 for Grades 9-12, $250 for Grades 6-8 and Summer $200 Grades 6-12. The fee covers uniform, track equipment, team liability insurance, meet entry fees, and USATF annual membership. Travel and accommodation to track meets will also be covered by the club. All fees must be paid prior to participating in practice. Fees are refundable within the first two weeks of practice if the athlete should decide to withdraw. » To be eligible for indoor competition travel, new members must register by November 9th. » To be eligible for summer competition travel, new members must register by May 30th. Mountain West Youth Track Club is non-profit organization and all funds will be used to the benefit of the Mountain West Youth Track Club. All of the track coaches are registered USATF coaches. They are required to have a background check completed through USATF and some have completed coaches training through USATF. What are my volunteer obligations? If Mountain West hosts a track meet or XC meet, we will need parent volunteers to take shifts to support events/races. The more volunteers available will ensure that the meet remains on time and runs smoothly. All communication is handled by phone (call or text) Vicky 406.370.9499 or Coach D 406.529.2013, via e-mail: vpounds (at) mwtc (dot) com, dianecummins (at) hotmail (dot) com, or Facebook: Mountain West Youth Track Club. If a practice is canceled, Coach D will typically send an email, text or Facebook post by 3pm, so it will be important to use and email that you can monitor during the day. » The athletes/parents are responsible for the cost of food during trips and all meets. » Addition club apparel is for sale, however purchase is optional. All proceeds will go to the club. » A good pair of running shoes should be purchased for the athlete. Spikes are optional, however advised. Your child will need to have a pair of athletic running shoes for practice and meets. Appropriate running attire should include; warm ups/sweats, running shorts, long and short sleeve shirts. Running spikes are an optional. Recommendation: Put your child’s name on everything they bring to the track.